This Blue-tooth/USB 2 in 1 barcode scanner is in Bluetooth default mode when turn it on first time. Step1: Press the trigger and hold it for 7 seconds or longer in Bluetooth pairing mode. Step2: To find and pair with the Blue-tooth barcode scanner on your device that you want to pair with. Blue-tooth wireless and USB-wire link 2 in 1 barcode scanner, easy to setup and compatible with Windows, Android, iOS/Mac OS and Linux and so on. Wireless communicate with Smart Phone, Tablet, Laptop and Desktop. Blue-tooth Adapter is in the package,it can transform your desktop to Blue-tooth device. 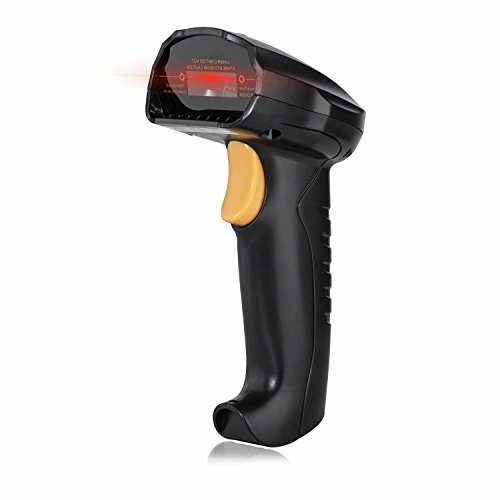 High recognizing sensitivity, easy to read blurry or broken barcodes under strong and dim light. Internal memory supports up to 5,000 Codes in inventory mode when no wireless link, and you can upload the data to your device when needed. Fully charged battery supports 90,000 scan, up to 33 Feet(10 meters) visible cover distance.